The mission of The African American Museum of Nassau County is to provide programming that fosters the intellectual development of anyone with an interest in African American history, culture and art. With it's multi-disciplinary educational approach, contemporary exhibitions, community events, lectures, film series, theatrical performances and instructional programming for the young and old, the African American Museum is more than just art. The African American Museum of Nassau County is a 6,000-square-foot museum, centrally located in Hempstead, offers a permanent exhibit and a rotating series of exhibits showcasing local and national African-American artists. The African American Museum is the only museum of it's kind on Long Island, one of the few in the country, and specializes in the history and culture of Blacks on Long Island. Winner of the American Legacy Magazine's "Heritage Award for Preservation of African American History and Culture", the museum was in the Spring of 2007 issue of the magazine as on of the ten best unique and less well-known black history museums in the United States. A fixture in Hempstead since 1970, The African American Museum (AAM) of Nassau County is newly renovated and revived in it's mission to provide programming that fosters the intellectual development of anyone with an interest in African American history, culture and art. 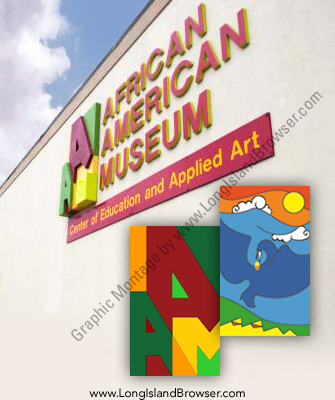 Over the past five and a half years, The African American Museum has expanded it's repertoire to include a rotating series of exhibits showcasing local and national artists, we also manage the Nassau Community College "Gear Up Rites of Passage" Program here at the museum for the second consecutive year. In addition, The African American Museum is directly associated with the African Atlantic Genealogy Society, Inc.This organization provides workshops and individual research instruction in family genealogy. With it's multi-disciplinary educational approach, contemporary exhibitions, community events, lectures, film series, theatrical performances and instructional programming for the young and old, the African American Museum is more than just art.